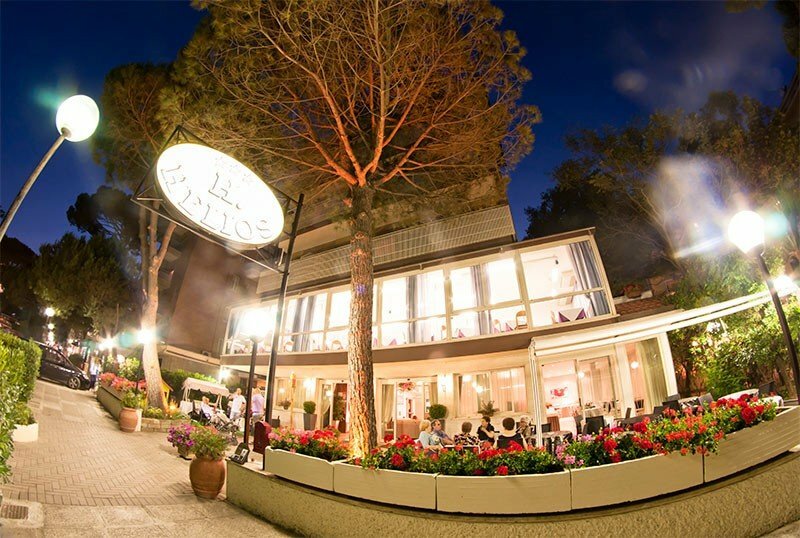 The Hotel Helios , 3 star hotel in Milano Marittima, is located near the beach and close to the center. It offers guests a family atmosphere, quiet and comfortable. It has free WI-FI connection throughout the entire hotel, indoor and outdoor parking and a local cuisine with fish every day. Admits pets of all sizes. Located on the coast between Cervia and Milano Marittima, the hotel enjoys a very convenient location: the beach can be reached on foot in one minute and a 10-minute walk will take you to the center of Milano Marittima, where the nightlife meets. of local shopping. The thermal baths of Cervia are also nearby, reachable in less than 10 minutes by car. All rooms have recently been refurbished and redecorated with modern wooden furniture. They are equipped with balcony (most with sea view), air conditioning, WI-FI connection, LED TV with satellite channels, direct dial telephone, safe and private bathroom with shower, hairdryer and complimentary toiletries. The minibar is available at an extra price. FAMILIES: communicating solutions and family rooms are available. Garden with chairs and tables, open-air porch, terrace, free use of bicycles, large hall, bar, elevator, TV room and reading with newspapers available. The hotel is also equipped for cyclists and organizes theme nights. AIR CONDITIONING : available in the room at no extra cost. PETS : admits pets of all sizes. BREAKFAST : international buffet, sweet and savory with homemade cakes, served in the garden or directly in the room. LUNCH AND DINNER : the kitchen, particularly cured by the management of Romagna, offers 4 menus with fish every day and traditional local dishes accompanied by a large buffet of appetizers and vegetables. Fresh pasta and homemade desserts every day. VARIATIONS : we prepare choices suitable for vegetarians, vegans and celiacs. In hotel : outdoor and indoor playground area, afternoon snack and baby-sitting service (at an extra cost). At meals : independent kitchen for mothers, bottle warmers, baby menu, baby food and seats at the table. The hotel has an agreement with the Bagno Oreste beaches n. 250 and Bagno Peppino n. 245, equipped with entertainment service for children, cabins, sunbeds and beach umbrella, hot showers and tennis courts and beach volleyball. The listed prices are per day per person for a minimum stay of 3 nights. Excluding Easter weekend, April 25th, May 1st and June 2nd. In the price list are excluded: drinks, beach service and tourist tax. TOURIST TAX: excluded. € 1.00 (April-May-September), € 1.50 (June-July-August) per person per day for a maximum of 7 consecutive nights, excluding children up to 14 years. - In the week of August, for stays of less than 7 days, prices may vary, at the discretion of the management. Promotion valid for the Easter holidays, Ponte 25 April and 1 May. From the 4th day onwards € 30.00 per day per person. Unmissable promotion for the veteran tennis championship. Minimum stay 7 days in full board at the price of € 50.00 per person in a double room, overlooking the tennis courts! Hurry up and ask for a quote, we have dedicated rooms! Offer valid for stays until May 15th to June 15th. If you book before March 15, the beach service is a gift! Plus: free children from 0 to 6 years! Offer not combinable with other promotions in progress. Contact us now to receive a free quote!